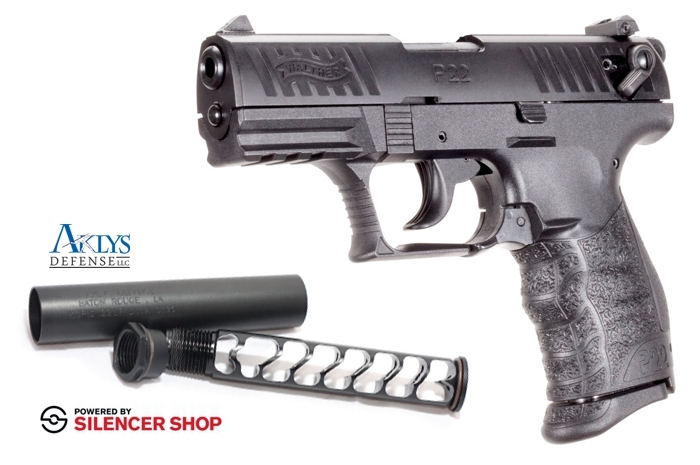 Walther P22 ($300) Rimfire Has Evolved. The .22 rimfire handgun will never look the same. The P22 changed everything. Walther adapted the tactical styling and Performance Design concepts from our centerfire handguns and applied them to the .22 L.R. This created a new movement in the design of contemporary rimfire handguns … and an explosion of imitators. As a stylish, fun gun to own, the P22 is at home on the shooting range, around the camp or in a museum of modern art. Aklys Defense Kopis 22LR ($299) is a mono-core suppressor manufactured from 7075 T-6 aluminum, and fully Type III Hard Coat anodized to provide a lifetime of heavy duty suppressor use. The Kopis suppressor’s three piece user serviceable design allows for ease of cleaning and requires NO special tools for disassembly. The Kopis has been optimized for minimal first round pop and excellent sound reduction while being extremely light weight and still maintaining its hard use durability, giving you a lifetime of suppressor enjoyment. The Kopis may be fired “wet” for ultimate sound reduction, but do not store it “wet” with any water based wetting agent. For best suppression results use subsonic loads to avoid the supersonic crack once the bullet has left the muzzle. The Kopis is rated for all .22LR, .22 Magnum, 17HMR, 17M2 ammunition and Full-Auto rated for .22LR. As shooters ourselves, we look at the industry as a whole and strive to introduce new and interesting iterations of the gear we manufacture to suite shooters like you and me. We are constantly looking for ways to improve the shooting experience through innovative design enhancements.